Now that we have the application running, let’s make two changes – make it run on port 80 and ensure that we don’t make life of our users hell by asking them to remember such a long URL. The sudo is required because the application will not run on port 80, and most Unix/Linux systems require admin/root privileges to run a server on ports below 1024. Now, you can browse to http://localhost/@HelloMojit/index. The next big thing to have the same content available at http://localhost rather than the otherwise obscure URL. 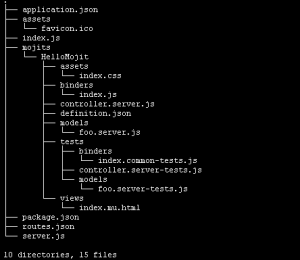 The routing configuration resides in a separate routes.json file. Why a separate file? Well, it definitely makes a sense to segregate the mojit-list and their access points. The content reads that for settings “master”, if anyone access the path "/" (root) using the HTTP GET method, call the action index of hello_mojit registered in application.json. Restart the server… and now you are ready to browse to http://localhost. Having said that, if you try to browser to the earlier URL, you should get a 404. Mojito application is pre-configured to ensure that if you do have at least one route registered, direct access to any mojit will not be allowed – ensures accidental access.